Recent Arrival! RWD 2019 Toyota 86 GT 2.0L H4 PDI DOHC 16V LEV II 200hp Ablaze NAVIGATION/GPS/NAV, 8 Speakers, Exterior Parking Camera Rear, Four wheel independent suspension, Front Bucket Seats, Heated door mirrors, Heated front seats, Leather Seat Material, Navigation System, Panic alarm, Power door mirrors, Power steering, Security system, Spoiler, Sport Bucket Seats, Steering wheel mounted audio controls, Traction control, TRD Performance Dual Exhaust, TRD Sway Bar Kit, Wheels: TRD 17" Forged Matte Gray (PPO). Proudly serving Elizabethtown and all of Kentucky for over 60 years! 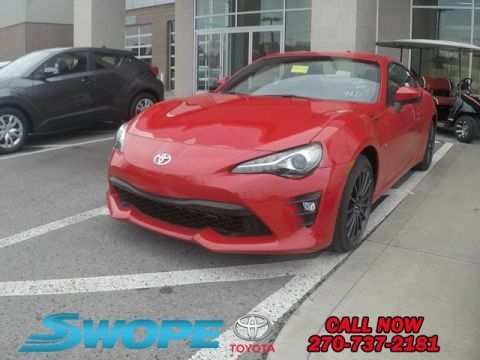 Call 270-737-2181 or (800) 999-7591 to schedule a test drive today. All prices plus tax, title, lic, and dealer processing fee.